Think you have may have storm damage? Don’t worry. We have provided this helpful checklist that will walk you through everything you need to check to make an initial inspection of your roof, siding, and gutters. Inspecting your home after a storm is very important. After a major storm has passed and you are sure your family is safe it is a good idea to inspect your homes roof, siding, and gutters. Note: We recommend that you do not attempt to climb up on your roof. Following a storm, the roof structure may be weak and roof shingles can be slippery. 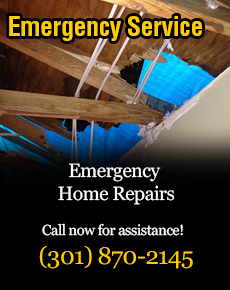 If you suspect or are sure you have roof damage, call a professional, call Metropolitan Design/Build (301) 870-2145. Below is a list of areas you can inspect following a storm. From the ground perform a visual inspection. Look for missing shingles, sections of siding and or trim that may have been blown off. Look for exposed wood from the roof deck or boards that were beneath the house trim. Perform this inspection from all sides of your house. From the ground visually check your home’s gutters, are they hanging down are the downspouts attached at all connections? Are there any sections pulled away from the house? Check the grounds around your home for blown off shingles, siding, house trim or gutter sections or other possible house materials. Inspect the siding, soffit, and fascia sections to ensure they are not torn or damaged. From the inside of your house look out any and all windows that overlook any sections of your roof. Look for any missing shingles, siding, and gutters sections. With a flashlight inspect the interior of your home. Start in the attic if you have access. Using your flashlight check for water leaks, or any signs of damage. Look carefully for damaged decking, water spots, or daylight shining through cracks. Perform a floor by floor, room by room inspection of your ceilings, walls, skylights, and windows for any signs of water leaks or water stains. Remember to check all interior areas. Don’t forget closets and garages too! If you see damage take notes of the damage and take pictures. Contact Metropolitan Design/Build at (301) 870-2145 if you discover damage and need emergency help or need to have a more detailed roof, siding, and gutter inspection.